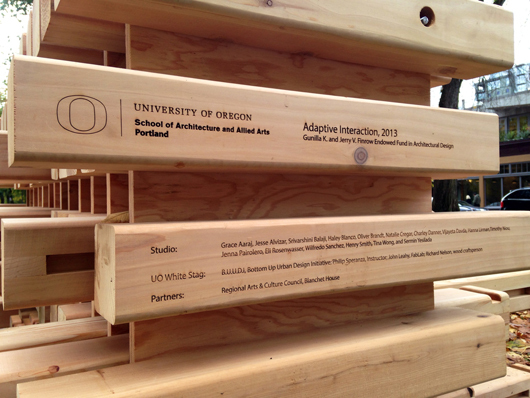 The Digital Arts program in Portland at the School of Architecture and Allied Arts is a unique option for students who elect to spend a fifth year refining the genre and their BFA work. 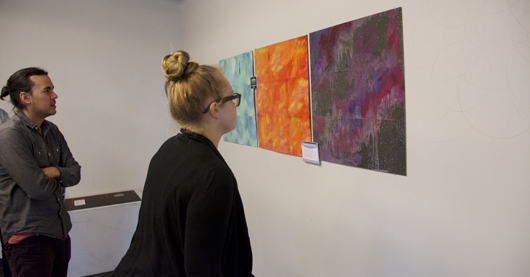 The program gives students an opportunity to connect to the thriving arts scene in Oregon’s largest and most cosmopolitan metropolis and sets the stage for continued connections, exposure, and integration into an arts and culture environment with a global reputation. Each term, the program invites a faculty member from Eugene or a guest instructor based in Portland to conduct the Portland group of students with a specific curriculum encompassing study and instruction, experience and lecture. For winter 2014, Rick Silva joined the Portland faculty and enlightened the students through a term’s worth of artistic endeavor. I had an opportunity to interview Silva this winter and he was good enough to provide responses to questions via email. What follows are his responses to a few select questions about his time in Portland and the experience teaching in the Digital Arts program here. 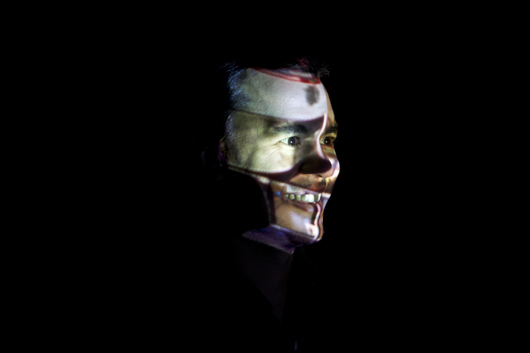 Rick Silva’s animations, videos, websites, performances, and video games explore landscape, remix and glitch. In his recent project enpleinair.org he is taking his laptop into the wild and creating 3D animations in response to the immediate terrain and elements. SP: How has teaching the Digital Arts program this term effected your work? RS: One of the two classes I’m teaching this term is a Web Art class. Web Art, or Internet Art, is a scene I’ve been active in for about a decade now. I often teach Internet Art as a small section in other digital art studio classes, but I haven’t had the chance to plan an entire course around it. Student’s lives are often so intertwined with the internet, but very few knew about how artists have used the web as a medium in the last 20 years. It was a great opportunity to rewind to early 90s Internet Art, to touch on some of today’s varied approaches, and to share some of my own history in the scene as well. Thinking about that class, and the history of Web Art, is working itself into some of my new projects that are web based. SP: Please comment on working in Portland and with the students in the Portland program…what opportunities are here for them? RS: The 5th year Portland BFA option is a really unique opportunity for our UO Digital Art undergrads, and it has been good for me to experience it first hand as a professor here this term. Students have close access to the whole Portland art, music, film, and design communities. They get a whole school year to work intensely on their creative practice, and to get weekly, even daily, feedback on their work from their peers, faculty, and community. Students also have access to some cutting edge equipment like Formlab printers, Oculus Rifts, sound booths, laser cutters, and more. Having a big final show at The White Box gallery [space] is an awesome opportunity as well. SP: How have the reviews with the Portland community reviewers contributed to the students’ practice and development of their work and ideas? RS: They become important markers of progress for the students as the year unfolds. The reviews make the students accountable to an audience outside of our classroom. SP: You have had an exhibition open during this term at the PSU Anzen gallery: was that recent work? And was it influenced at all by your being in Portland? Has Portland contributed at all to your professional practice? Are there opportunities here that you have been impressed with or have contributed to your work? RS: Yes, that was recent work. The exhibition at PSU was done in collaboration with an artist run space I’m a member of called Ditch Projects. When Ditch Projects has a members show we don’t usually credit each person’s work, so often each of us takes the opportunity to step outside our styles and try something new. My work is often situated outdoors, and I hardly ever work with text in my videos, so I used this exhibition opportunity to make a 3D animation that has a a very white gallery scene with rotating white pedestals, and digitally spray painted text that spins around and reveals itself on a loop once a minute. This work was not really influenced by Portland, more just the parameters and theme of the exhibition. I do often think about place or displacement in my art, and sometimes that comes after I’ve lived or visited somewhere, I’m sure something Portland-esque will find its way into a future project. SP: What have been some of the highlights of the term in your program for this group of students? RS: One highlight was an assignment I gave in the Web Art class, where students were asked to create real world objects influenced by internet technology or culture. One student created physical “pop ups” and put them on all the other student’s projects. It was interesting how as we walked around and talked about all the projects one by one, and everyone just ignored the added “pop ups,” exactly how we ignore ads on the internet in real life. SP: Who have you brought in as guest artists or speakers? RS: This term we’ve had Jeremy Rotsztain, a local digital artist that focuses on touch interface / software art. Jordan Tate, an artist and professor from Cincinnati. And Krystal South, a Portland artist/writer/designer. SP: Have you done anything specific to being in Portland—taking or talking to the students about what is here and how they can integrate or be involved with the artistic community? RS: Yes, on my course calendars I list as many Portland art/design happenings that I can find, and urge them to engage with the local scene. In discussions, I bring up a lot of Portland artists, designers, galleries, and institutions as examples. It’s great to point to art that is happening in the city right this moment, for example the PSU Ditch Projects show, or the 2014 Portland Biennial. SP: Any comments you can add about your work (current) directions you are going in, influences you have in your work, or new ideas you are exploring? RS: I’ve been thinking a lot about bird migration patterns this term. I saw this link from a Portland news station the other day that really resonated with me. It talks about these migrating birds that are being digitally mapped by weather radars during the night. I’m thinking that will for sure end up in a new project somehow. Many thanks to student Dave Braithwaite for the images used in this post. In the winter of 2013, students in Philip Speranza’s Place Branding for Public Services studio collectively made a single, full-scale urban installation fabricated entirely by 4 x 4 boards. 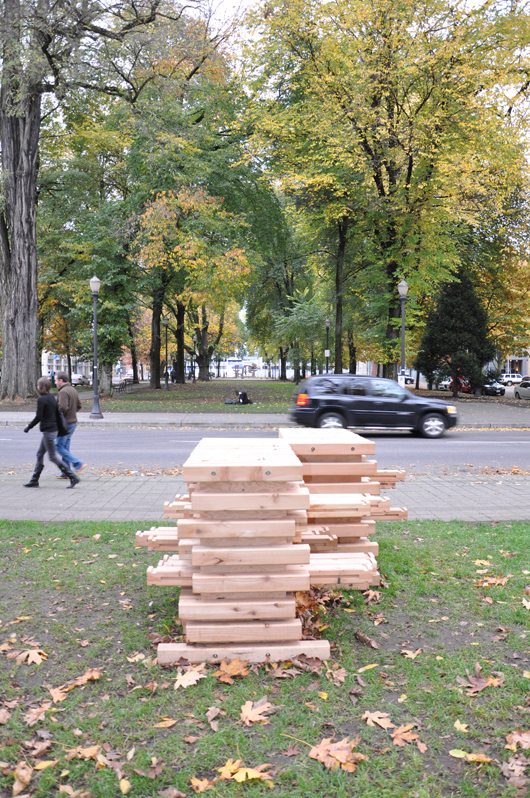 The students’ finished work was presented to Portland’s Regional Arts and Culture Council and the proposal made that it be deployed in local parks as an object that would inspire “an urban intervention and evoke a conversation of the values of a city….that are based on the very compassion for one’s fellow citizen.” Under Speranza’s direction, the studio investigated Bruno Latour’s idea of “attachment” as a way to connect a work to the live human context of a site over time. The entire installation lay dormant for several months housed in the UO in Portland’s Under the Bridge Space while Speranza worked tirelessly to obtain permits, and permissions. 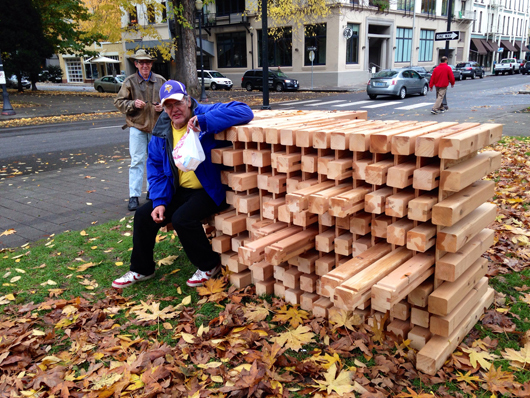 On November 2, the piece, titled simply, Bridging successfully made its way into the public eye when a small group of students, along with Speranza, loaded up the boards on a rainy afternoon and re-constructed the piece on the damp grass of the North Park Blocks between Davis and Everett streets, firmly nestled in the greenway that unites the Pearl District and Old Town | Chinatown in Northwest Portland. Architecturally-inspired and artistically-conceived, Bridging is a relatively approachable piece built entirely of 4 x 4 cedar boards that form a block-like structure about 4’ high and 9’ long and 2’ wide. Boards 4’ in length slide in and out of the block to project from either side forming both places to sit and places that are desk or table-like….places to sit near a companion or places to be next to a stranger. 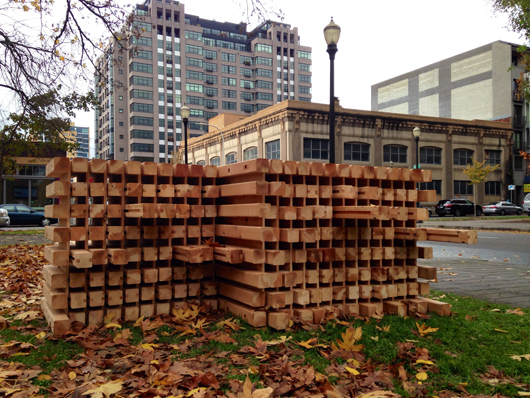 This human-scaled structure was conceived of by the sixteen architecture students named above (all from the School of Architecture and Allied Arts, University of Oregon in Portland at the White Stag Block) who designed and built Bridging during the winter term 2013. The students had investigated ideas of place branding and public service in Portland, Oregon and Barcelona, Catalunya. Diagramming and parametric design methods led to the use of traditional and digital fabrication techniques in the White Stag Block Fab Lab and Woodshop with John Leahy. Studio reviews conducted during the winter of 2013 term provided invaluable input from members of the Creative Corridor including partners and collaborators, Kristin Calhoun of the Regional Arts and Culture Council, wood crafts person and designer Richard Nelson, Corey Schreiber of UI Culinary Institute, Bob Hastings of Trimet, artist Tad Savinar, Brian Ferschweiler of Blanchet House, faculty from the University of Oregon and other members of the Portland community. The project came together with a strong sensitivity for the importance of community and keeping the audience (the people of the area) a crucial part of the partnership and involved in the process of imagining where and how Bridging would be integrated into the community. Goethe wrote that architecture is “frozen music,” and Bridging is its own diminutive arabesque. The piece is small and forte enough to make one wonder if it is meant to be climbed upon or simply observed; the pixel-like translation of the 4 x 4’s creates a rhythmic and tantalizingly predictable ornate patterning –visually making this piece captivating. The spaces between the boards, channeling light through the piece with minuscule sense of regimented authority adds to this patterning further accentuating the idea of bridging—even light is taken from daylight and allowed to explore travelling through the installation and peeking out the other side with almost musical precision. Bridging cleverly bridges worlds we exist in from numerous insightful angles—that of the handmade and handcrafted to that of the computer-generated and rendered in pixel imagery. It is by no means in error that the 4 x 4 squares grouped together in a predictable formation to create a greater whole remind us of the pixels prevalent in such massive yet imperceptible quantity on our computer screen and are responsible for concocting the digital images we are bombarded with daily. 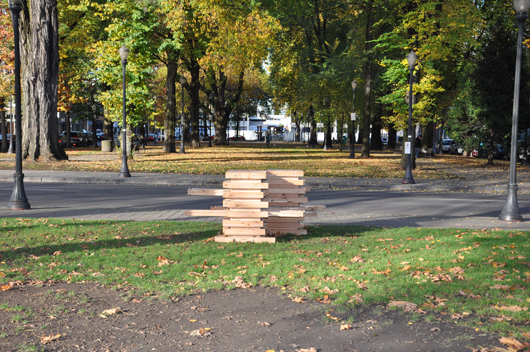 For its premiere deployment, Bridging has been carefully placed in Portland’s Creative Corridor North Park Blocks where it will stay for the month of November. To the very north, stands Lee Kelly’s magnificent (at 23’ wide, 11’ high and 6’ in depth) cor-ten steel monument, Memory 99 patiently waiting to majestically define future-Pacific Northwest College of Art’s courtyard entrance. To the west, lies the bustling, affluent, and delightfully albeit understandably supercilious Pearl District; to the east, Old Town | Chinatown quivering with self-discovery, robust cultural history, and renewal, where the city’s homeless and destitute can find shelter, food and comfort and the winds of change have blown in to bring both economically refreshing merchant opportunities and significant, community-enhancing educational institutions (one of which is the UO’s own White Stag Block). This entire area, fundamentally, is a place of change, of melding social stratospheres, and a place where a short walk of a few blocks will make it clear just how those who have can, and do, co-mingle with those who have very little. Immediately to the south of Bridging, the North Park Blocks offer a well-used children’s playground, and Hao Baozhu’s generously donated life-sized bronze elephant. 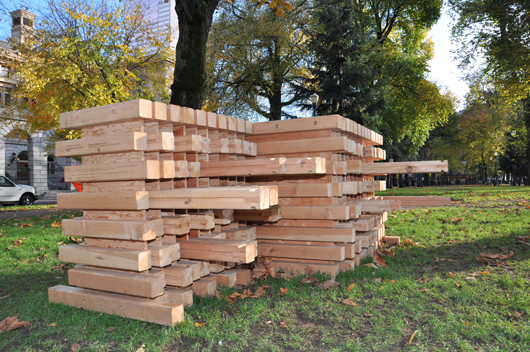 Indeed, the location is ideally suited to objects that encourage play, interaction and exploration and, due in large part to the efforts of Portland’s Regional Arts and Culture Council and executive director, Eloise Damrosch there already exists here a sort of city tradition of placing major artwork in the Park Blocks that began with the South Park Blocks and RACC’s public art projects. Into this socially, economically and culturally vibrant environment, the semi-permanent, pristine Bridging might seem a bit overshadowed, its scale dominated by time-induced patinas of nearby permanent work, its wet and unfinished wood surface prone to the ravages of weather. Indeed, even the towering elms with leaves seasonally adrift surrounding the installation with a framing like quality seem just a bit dwarfing. In only the few days Bridging has been in situ and in the damp, discouraging gray of a Portland afternoon, passersby can’t help but stop and touch, look and wonder. Possibly mostly due to a rain-drizzled surface, not many have ventured to sit down on the invitingly pulled-out boards, made ready to give one a place at the table. However, judging from the top surface scuffed and imprinted with the dark marks of shoe treads, apparently, the piece has proven to have an exploratory “soap-box-like” appeal. Stand next to Bridging for a little while, dry off a few of those boards, and actually invite people to touch and explore, show them how to sit, put down a coffee cup and something happens. Now public art is not meant to come with directions nor suggestions on how to use the piece or what to do with it, this is in the hands, and delight, of the individual—the chance to explore, to look or to physically experience an object is diplomatically left to one’s own personal discretion. Bridging is a captivating community piece and has so much potential to launch conversations powered by community in a non-rebellious and non-confrontational way that encouraging people to experience the sit-down-with-me connection and interacting with the audience for Bridging proves an illuminating undertaking. I tried this one rainy afternoon. With cappuccino in hand, I stood by Bridging, offering explanations and demonstrations to any interested passersby. All were eager to listen. Some asked why. Others seemed to need no explanation as if simply a place to sit was explanation enough. But when I tried the true social experiment, asking the public to share the space with individuals from the community of varying backgrounds, (the reason behind Bridging), things got really interesting. Bridging, 2013 evokes understandings of identity and public service. 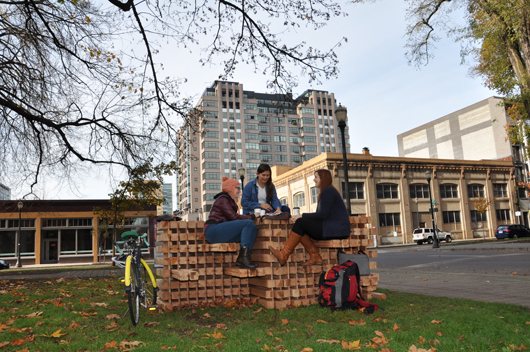 Citizens and visitors of Portland interact through this art piece to sit, eat, rest and converse, adapting the piece for individual uses. The traditional boundaries of orientation and personal space are intentionally blurred to raise consciousness through unplanned social interactions. 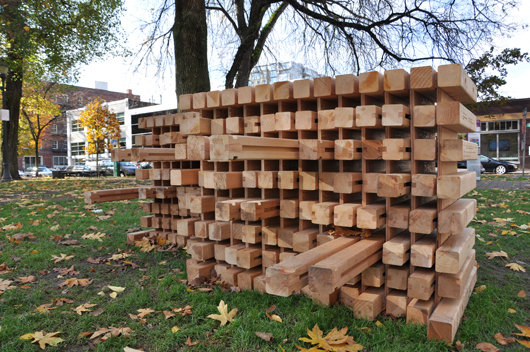 Interactions are bridged from one side to another by three types of 4×4 inch cedar units. Long cedar units slide for seating. Shorter interior cedar units slide for play. The two sliding movements give over ownership of the form to the user. Outer cedar units are fixed. When I had the opportunity to explain the intention of Bridging, people were interested; when I pulled out and gestured to the boards ready for them to sit, things were a little more tense. With Speranza’s directive in mind, I purposefully welcomed anyone who walked by the installation to take a seat and learn about the piece. I offered, with equal hospitality, a place to gentlemen pushing tarp-covered grocery carts piled high with worldly possessions and to debonair, pipe-smoking urbane individuals. Both seemed reluctant to acknowledge or sit close to the other. Many times, if one sat down, the other left. Admittedly, it is a tall order-to ask and to expect mere strangers to sit with each other as if acquainted. Was it the social distance or the lack of familiarity with one another? Bridging was compelling us to recognize there are barriers, invisible, intangible, but barriers nonetheless. Bridging being used by local residents. Speranza says, “Subsequent installations will bridge unintended social interactions between citizens with regard to neighborhood orientation and will occur for approximately one month in each O’Bryant Park, Jameson Square and Holladay Park through the winter 2014.” One can’t help but wonder what the reception at these other places will be and what that will say about our own dear neighborhood. Speranza and his group of students have mindfully moved past divisions and asked us to graciously move past them, too: recognizing the socioeconomics of what surrounds us might be one of our most important observations. Unquestionably, much of urban life allows us to exist in a bubble of our own comfort level. It is places like the Creative Corridor, and the North Park Blocks where exploring these divisions can make a difference. You can ask yourself how you would react in this situation, if asked in a pleasant outdoor park to sit down and share your space with a complete stranger, be he dressed similarly or vastly different from yourself and in varying degrees of cleanliness. Would you sit down and share a conversation? Would it be exhilarating or exhausting? Awkward or illuminating? Portland is a vibrant city, attractive to permanent residents and tourists; the region spanning the Pearl District and Old Town | Chinatown accommodates feelings of belonging from diverse backgrounds and economic levels compelling solutions that embrace the real essence of a city: the ability to cope with everything from hardship to success, from recession and homelessness to affluence and excess. Bridging, in a small way, reflects these imperative ingredients—urging us to sit and engage in dialogue or proximity to every aspect of our city, from ethnic diversity, to economic hardship and the unhomed, to the luxury of high-priced retail shops and social opportunities in bars and clubs of varying clientele and challenges us to make something of an experience or recognize the need for a solution embracing tolerance and diversity. Bridging gently encourages and challenges us to reach new conclusions about the people in our neighborhood, about us. And it has provided a group of University of Oregon students an opportunity to experiment with how shared experiences and collaborations can be kindled and the possibility of inviting people to feel a sense of belonging. The work is an open-ended invitation for people to come together and relate to each other on a very basic human level- sharing a meal together. I am looking forward to seeing and experiencing the work in the various locations and seeing how the stories unfold. That is part of the magic of putting work out into the public to me, seeing how it is received, used & interpreted by the broadest possible audience. 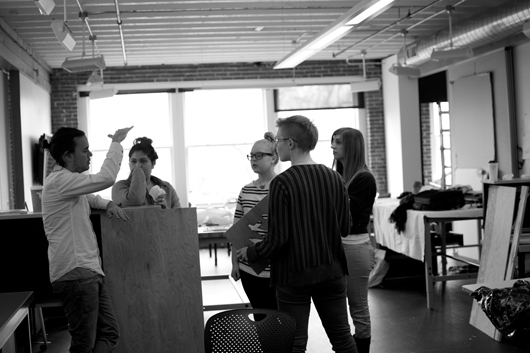 Bridging embodies the highest and best values of UO’s School of Architecture and Allied Arts. Intellectual speculation, hands-on experimentation, and open-ended social activism, applied in the service of ‘making good’, ideas, conversations and experiences in the context of real community. This last week, protestors once again gathered in downtown Portland to bring attention to the Occupy movement, and the city was reminded of the importance of community, and the power of community. As the waterfront of Portland was dotted with protestors, some of them masked, and mounted police stood by ready to subdue these contemporary insurgents, Bridging took on a new meaning. Rather than such collisions of politics and people, of police and protestor, are there ways we can offer a better incubator to solutions by tolerance and diversity being invited to sit at the same table? We have Portland—and this remarkable Creative Corridor—within which contains the components of a vital urban future—from the wandering nomadic-like unhomed, to the struggling recession-emerging businesses to economically vibrant shops, restaurants, world-renown places of creativity and innovation and the thriving intellectual university and college environment –all prevail along our streets effectively bringing us together. Sit at the table of Bridging and talk to your neighbor…. from unexpected collaborations, to unpredicted connections: so much is possible. In the timeless words of American singer-songwriter, folk musician, Woody Guthrie, “this land is your land, this land is my land.” Please take a moment to stop by Bridging and take your place at the table; because it is yours and it is mine, and we should all be talking. Place Branding of Public Service pdf available here. Craig Hickman stands in front of one of the White Box walls displaying work from his Portland Creative Community 1.0 exhibition. As a young man of 17 in 1960s Portland, Oregon, Craig Hickman carried around a camera—without much in the way of rigorous intention and devoid of a strict or limiting sense of an impending project. Hickman, instead, gently wielded his Nikon- F pointing it at friends, lovers, places, and people, many times strangers, he saw around him. The camera operated as an extension of himself, a way to casually document day-to-day life and a way to capture moments that intrigued him. At times, fully immersed in a moment of fun and experimentation, he would hand his camera to a friend who would turn the lens on Hickman himself, producing an unprompted photograph of the photographer. 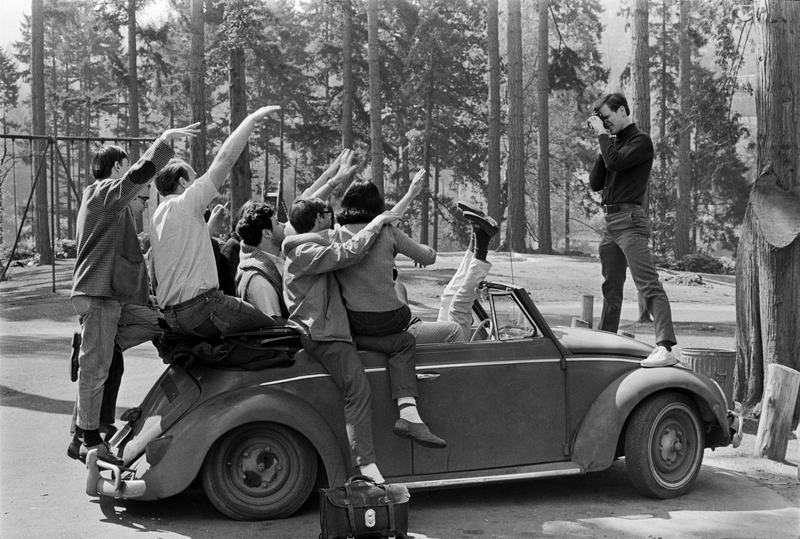 A photograph of the photographer: Craig Hickman takes a group photo of the PSU yearbook staff. Hickman followed an early path that would continually fuel his passion for photography and would branch out to include his development of significant computer software (Kid pix), becoming a professor in the University of Oregon Digital Arts program (Department of Art) and a career as a successful, highly acclaimed photographer known for his playful and insightful integration of word and image, and the digital manipulation of images. In the 1960s and 1970s as a student, Hickman worked on the Portland State University yearbooks (yearbooks that with the influence of Hickman and his core cadre of comrades at PSU were artistically designed and intended more as “photobooks” than conventional yearbooks). These photobooks were lively publications rife with journalistic documentation of the assemblies and protests of 1960s, honest portrayals of student life and campus involvement, glowing and sensitive portraits of fellow students, at work, at play, in love. 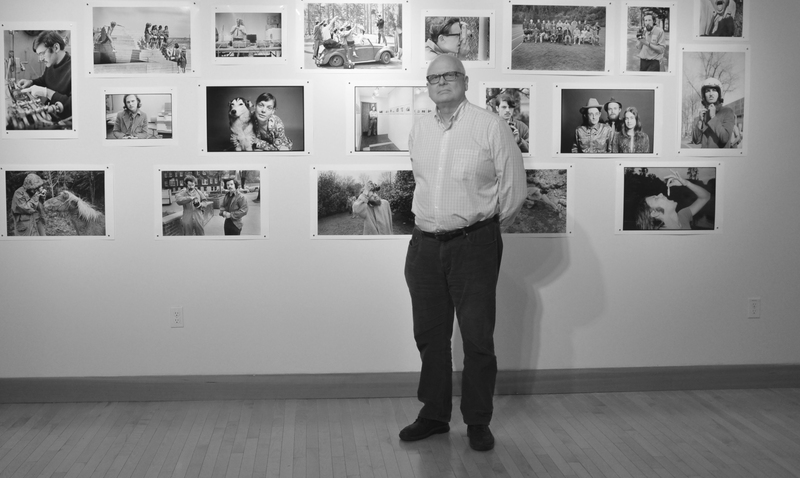 Leaving PSU in the 1970s, Hickman continued his education and immersion in photography becoming a staff photographer at Evergreen State College (Olympia) and teaching courses at ESC in photography. Intertwined in these pursuits, Hickman would find the time to commute back and forth from Olympia to Portland to initiate and help launch Blue Sky Gallery along with close friends, Chris Rauschenberg, Ann Hughes, Bob DiFranco, and Terry Toedtemeier. Eventually, with Blue Sky set well on its way to emerging as an international, leading photographic gallery, Hickman decided to enroll in graduate school in the early 1980s and pursue studies towards a Master of Arts in photography from University of Washington. Craig Hickman photo | From the Portland Creative Community 1.0 exhibition at the White Box. While the importance of this early social context and history cannot be ignored this exhibition has many facets. 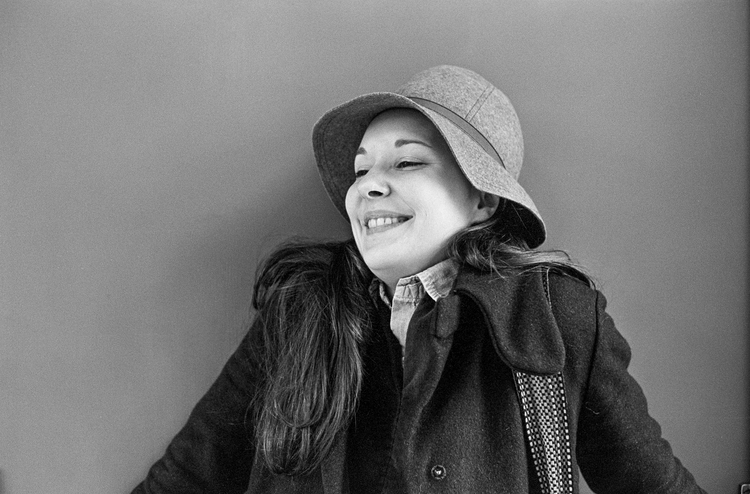 Undoubtedly, there is something so fascinating about images of some of Portland’s now well-lauded creatives captured on film some 40 years ago, capering about, full of youthful exuberance and the in the rudimentary stages of what would become remarkable careers. 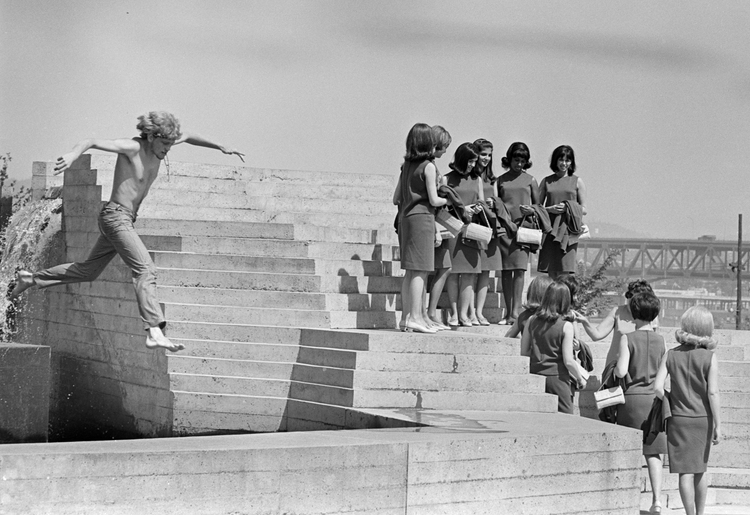 Indeed, you will most likely never again stumble upon a photo of Terry Toedtemeier experimenting playfully with his very first camera en plein air or see individuals like Ann Hughes or Chris Rauschenberg caught spontaneously in the moment, personality and visage bare and vulnerable. Or even the day Craig Hickman was introduced to his very first computer…..yes, these images, and more, are all here. Yet, the impact of this exhibition far outlasts a nostalgic recognition of faces and places or any sense of self-congratulatory Portlandia-like mythology. Much of the beauty and power of this exhibition lies in the fact that many of its viewers will not recognize a single face, nor know a single name, and will have never have seen the preachers, teachers, intellectuals, leaders, policy makers caught here on film, or printed on paper. And, that is fine. As, with any great art and with any exhibition worth one’s time and contemplation, Portland Creative Community 1.0 will pique curiosity and encourage thought. This is an exhibition of truly democratic proportions and Hickman by not captioning his images, nor titling them allows us to view the entire show from our own perspective. 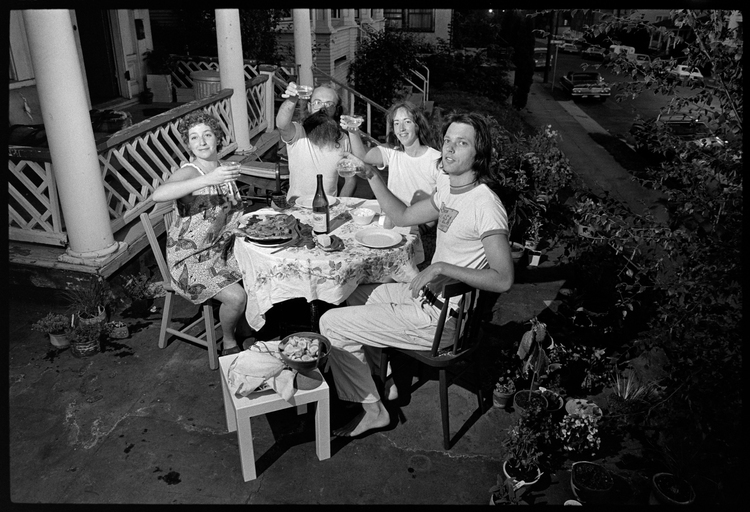 Admittedly, this is the essence of Hickman’s work: it has a current of life coursing through it, a quiet, unassuming joie de vivre, paired with a sensitive reflective quality (look at those close up portraits—the expressions are real, the moment of authenticity embraced by both photographer and his subject). The images of political protest are not so much angry or supportive but have an “I am standing here and seeing this” reflective quality or as Hickman says, these are images of “Whoever came my way and made the best picture.” The images of politicians stand not as propaganda neither scathing nor patriotically nationalistic; the images of Hickman’s friends not contrived, not staged; the images of women Hickman loved, not glamorous, but real, occasionally playful: women, you get a sense were appreciated, looked at with compassion and wonder. These pictures tell a story—in a series of spontaneous moments unfolding with the purest of intentions—blown-up snapshots taken of life-sized humanity doused with a pervading sense of community. And, so we come to the question of size. You will immediately notice there is a size issue at play here. Hickman boldly asserts that the selection of impressively large prints was intended as “fun—to not have the picture come to you—you get to walk into the situation.” Indeed, the walls of the White Box are collaged with a significant number of Life-magazine-like, life-size prints both printed and projected compelling one to wonder if there is notable intention in such monolithic reproductions. The emotional and visual quality delivered by the size of the images only lets us in closer….with a come hither temptation to sink our field of vision into one of these and see people, people just like us. In large format, the expressions are closer, the glances accessible—we see anxiety in one man’s eyes, and, in another, can that possibly be a sense of trepidation in the faces of young sailors surrounding a navy propaganda poster where an illustration of a strapping young sailor salutes with confidence and vigor? The message here is one of giving us the independence and courtesy to just look where we want. Hickman trusts his audience to see something of interest. Let your gaze wander, or stare at one and lose yourself in a single image, either way you will be drawn down a path where you are visually compelled to form a new sense of connection to the people in the images before you. Hickman’s photos have a warmth to them, a sense of understanding, of humility, of empathy. Enhanced by the simple palette of black and white, Portland Creative Community 1.0 appeals to our emotional connections by way of this inherent connectedness to humanity. A few years ago, something prompted Hickman to delve into boxes and boxes of his saved negatives—negatives that included his images shot decades ago at a time when Portland was a city contemplating urban growth boundaries, constructing freeways, grappling with controversial decisions made by the Portland Development Commission, and when students were sometimes more activist than academic, and our beloved Park Blocks could potentially play host to tumultuous scenes of riot police dragging resistant protestors. Into this socio-political urban landscape strode Hickman, camera always in hand ready to capture the closest image that looked, to him, the most interesting. Without flash, planned or artificial lighting, or contrived situations, Portland Creative Community 1.0 reveals a subtle honesty—a mastery of the manual camera managing to find a brilliant way to mingle human-controlled aperture and shutter speed with today’s computer-based digital camera and all the trappings of modern technology. But that seems to add to the vitality and intrigue of this display of memory and reminiscence, so an explanation is in order. 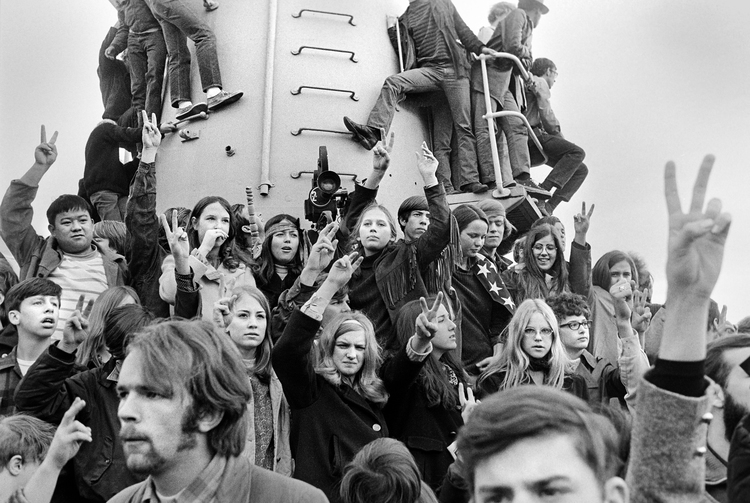 Most of Hickman’s photos from this 1960s-1970s era were never developed, no contact sheets ever printed. A fact that makes the first-time exhibition of these photographs all the more meaningful. For Hickman the last few years have been a journey into the past to see images he hardly recalled and certainly had no idea what would be found. Perhaps it was a romantic sense of melancholy reflection or the simple existence of spare moments, or a basic desire to see what he had been packing around all these years (in, as Hickman calls it, his “deep archive”). Whatever the impetus, Hickman began unpacking his deep archives, and literally hundreds of photos have now come to light. Concocting ways to unearth these black and white celluloid treasures and bring them to a new audience has, in itself, been a curious study in merging 1960s camera equipment and developing methods with modern technology and the vast, immediate land of social media. While the length of years has seen great movement in the technologies available to take pictures, a span Hickman has never stepped away from, it also produced the incredible opportunity to bring this series of images to life using techniques and process unknown when the images were themselves taken. And, of course, the ability to “post” his newly digitalized photos on Facebook, tagging them with names of those within the images: the subjects seeing the images for the first time, as well, effectively created quite a social media buzz. The process of printing these photos and a placing them in a public place for eyes to view them beyond Hickman’s significant social media following has enveloped process and method unifying technologies and compelling Hickman to discover new ways of experimenting with images originally intended for the black depths of a darkroom. Upon unpacking the negatives, Hickman would place them under the scrutiny of fluorescent light bulbs shining from beneath a layer of plexi—the ubiquitous light table—a piece of equipment that somewhat awkwardly finds itself still in use but not always to light negatives, slides or contact sheets but moreso a fine surface to place the modern images of today—a work surface bridging eras. Onto this light table, the piece that would unify technologies, Hickman placed his negatives and proceeded to bring them to life. Negatives that once would have never seen the light of day until printed and dried, now were exposed on a light table and infused with an existence by millions of pixels. Hickman began by using a macro-lens on the light table and digitally photographed the negatives; he then reversed and restored the images to pristine condition using Photoshop, employing the tool to remove dust and scratches. Hickman comments that the black and white negatives had no fading and were preserved in excellent condition. As an element of this show, the bold melding of technologies and the way Hickman wove the computer digital age into this exhibition stands as a commentary on the history of photography and the changing methods and process that leads to a finished and viewable image. Blending old with new, Hickman expands the process and displays his remarkable ability to interpret photography from a truly inclusive standpoint. A stunning visual communicator, Hickman confidently embraces the best of both worlds using tools that exemplify an understanding of photographic technologies, and, perhaps more importantly, allowing his audience to glimpse his personality and feel a sense of integration with our past and our present. There is a story embedded in each of Hickman’s images that you will be able to explore by flipping through and reading a printed and online catalogue of the prints in the exhibition. But maybe you don’t need that—each picture alone is worth a thousand words, quite conceivably, more.